For the astronomical device, see tellurion. Tellurium is a chemical element with symbol Te and atomic number 52. It is a brittle, mildly toxic, rare, silver-white metalloid. Tellurium is chemically related to selenium and sulfur. It is occasionally found in native form as elemental crystals. Tellurium is far more common in the universe as a whole than on Earth. Its extreme rarity in the Earth's crust, comparable to that of platinum, is due partly to its high atomic number, but also to its formation of a volatile hydride which caused it to be lost to space as a gas during the hot nebular formation of the planet. Tellurium was discovered in the Habsburg Empire, in 1782 by Franz-Joseph Müller von Reichenstein in a mineral containing tellurium and gold. 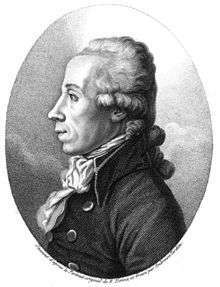 Martin Heinrich Klaproth named the new element in 1798 after the Latin word for "earth", tellus. Gold telluride minerals are the most notable natural gold compounds. However, they are not a commercially significant source of tellurium itself, which is normally extracted as a by-product of copper and lead production. Commercially, the primary use of tellurium is copper and steel alloys, where it improves machinability. Applications in CdTe solar panels and semiconductors also consume a considerable portion of tellurium production. Tellurium has no biological function, although fungi can use it in place of sulfur and selenium in amino acids such as tellurocysteine and telluromethionine. In humans, tellurium is partly metabolized into dimethyl telluride, (CH3)2Te, a gas with a garlic-like odor exhaled in the breath of victims of tellurium exposure or poisoning. Tellurium has two allotropes, crystalline and amorphous. 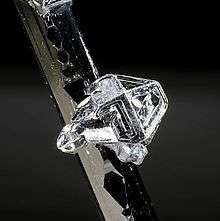 When crystalline, tellurium is silvery-white with a metallic luster. It is a brittle and easily pulverized metalloid. Amorphous tellurium is a black-brown powder prepared by precipitating it from a solution of tellurous acid or telluric acid (Te(OH)6). Tellurium is a semiconductor that shows a greater electrical conductivity in certain directions depending on atomic alignment; the conductivity increases slightly when exposed to light (photoconductivity). When molten, tellurium is corrosive to copper, iron, and stainless steel. Of the chalcogens, tellurium has the highest melting and boiling points, at 722.66 K (841.12 °F) and 1,261 K (1,810 °F), respectively. Tellurium adopts a polymeric structure consisting of zig-zag chains of Te atoms. This gray material resists oxidation by air and is not volatile. Naturally occurring tellurium has eight isotopes. Six of those isotopes, 120Te, 122Te, 123Te, 124Te, 125Te and 126Te, are stable. The other two, 128Te and 130Te, have been found to be slightly radioactive, with extremely long half-lives, including 2.2 × 1024 years for 128Te. This is the longest known half life among all radionuclides and is approximately 160 trillion (1012) times the age of the known universe. Stable isotopes comprise only 33.2% of naturally occurring tellurium. A further thirty artificial radioisotopes of tellurium are known with atomic masses ranging from 105 to 142 and with half lives of 19 days or less. There are also 17 nuclear isomers, with half lives of up to 154 days. Tellurium (106Te to 110Te ) is among the lightest elements known to undergo alpha decay. The atomic mass of tellurium (127.60 g·mol−1) exceeds that of iodine (126.90 g·mol−1), the next element in the periodic table. Native tellurium crystal on sylvanite (Vatukoula, Viti Levu, Fiji). Picture width 2 mm. 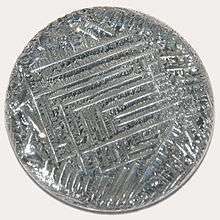 With an abundance in the Earth's crust comparable to that of platinum (about 1 µg/kg), tellurium is one of the rarest stable solid elements. In comparison, even the rarest of the lanthanides have crustal abundances of 500 µg/kg (see Abundance of the chemical elements). This rarity of tellurium in the Earth's crust is not a reflection of its cosmic abundance. Tellurium is more abundant than rubidium in the cosmos, though rubidium is ten thousand times more abundant in the Earth's crust. The rarity of tellurium on Earth is thought to be caused by conditions during the formation of the Earth, when the stable form of certain elements, in the absence of oxygen and water, was controlled by the reductive power of free hydrogen. Under this scenario, certain elements that form volatile hydrides, such as tellurium, were severely depleted through evaporation of these hydrides. Tellurium and selenium are the heavy elements most depleted by this process. Tellurium is sometimes found in its native (i.e., elemental) form, but is more often found as the tellurides of gold such as calaverite and krennerite (two different polymorphs of AuTe2), petzite, Ag3AuTe2, and sylvanite, AgAuTe4. The city of Telluride, Colorado was named in hope of a strike of gold telluride (which never materialized, though gold metal ore was found). Gold itself is usually found uncombined, but when found as a chemical compound, it is most often combined with tellurium. Although tellurium is found with gold more often than in uncombined form, it is found even more often combined as tellurides of more common metals (e.g. melonite, NiTe2). Natural tellurite and tellurate minerals also occur, formed by oxidation of tellurides near the Earth's surface. In contrast to selenium, tellurium does not usually replace sulfur in minerals because of the great difference in ion radii. Thus, many common sulfide minerals contain substantial quantities of selenium and only traces of tellurium. In the gold rush of 1893, miners in Kalgoorlie discarded a pyritic material as they searched for pure gold, and it was used to fill in potholes and build sidewalks. In 1896, that tailing was discovered to be calaverite, a telluride of gold, and it sparked a second gold rush that included mining the streets. Tellurium (Latin tellus meaning "earth") was discovered in the 18th century in a gold ore from the mines in Zlatna, near today's city of Alba Iulia, Romania. This ore was known as "Faczebajer weißes blättriges Golderz" (white leafy gold ore from Faczebaja, German name of Facebánya, now Fața Băii in Alba County) or antimonalischer Goldkies (antimonic gold pyrite), and according to Anton von Rupprecht, was Spießglaskönig (argent molybdique), containing native antimony. In 1782 Franz-Joseph Müller von Reichenstein, who was then serving as the Austrian chief inspector of mines in Transylvania, concluded that the ore did not contain antimony but was bismuth sulfide. The following year, he reported that this was erroneous and that the ore contained mostly gold and an unknown metal very similar to antimony. After a thorough investigation that lasted three years and included more than fifty tests, Müller determined the specific gravity of the mineral and noted that when heated, the new metal gives off a white smoke with a radish-like odor; that it imparts a red color to sulfuric acid; and that when this solution is diluted with water, it has a black precipitate. Nevertheless, he was not able to identify this metal and gave it the names aurum paradoxium (paradoxical gold) and metallum problematicum (problem metal), because it did not exhibit the properties predicted for antimony. In 1789, a Hungarian scientist, Pál Kitaibel, discovered the element independently in an ore from Deutsch-Pilsen that had been regarded as argentiferous molybdenite, but later he gave the credit to Müller. In 1798, it was named by Martin Heinrich Klaproth, who had earlier isolated it from the mineral calaverite. The 1960s brought an increase in thermoelectric applications for tellurium (as bismuth telluride), and in free-machining steel alloys, which became the dominant use. The principal source of tellurium is from anode sludges from the electrolytic refining of blister copper. It is a component of dusts from blast furnace refining of lead. Treatment of 1000 tons of copper ore typically yields one kilogram (2.2 pounds) of tellurium. The anode sludges contain the selenides and tellurides of the noble metals in compounds with the formula M2Se or M2Te (M = Cu, Ag, Au). At temperatures of 500 °C the anode sludges are roasted with sodium carbonate under air. The metal ions are reduced to the metals, while the telluride is converted to sodium tellurite. Tellurites can be leached from the mixture with water and are normally present as hydrotellurites HTeO3− in solution. Selenites are also formed during this process, but they can be separated by adding sulfuric acid. The hydrotellurites are converted into the insoluble tellurium dioxide while the selenites stay in solution. The metal is produced from the oxide (reduced) either by electrolysis or by reacting the tellurium dioxide with sulfur dioxide in sulfuric acid. Commercial-grade tellurium is usually marketed as 200-mesh powder but is also available as slabs, ingots, sticks, or lumps. The year-end price for tellurium in 2000 was US$14 per pound. In recent years, the tellurium price was driven up by increased demand and limited supply, reaching as high as US$100 per pound in 2006. Despite the expectation that improved production methods will double production, the United States Department of Energy (DoE) anticipates a supply shortfall of tellurium by 2025. Tellurium is produced mainly in the United States, Peru, Japan and Canada. The British Geological Survey gives the following production numbers for 2009: United States 50 t, Peru 7 t, Japan 40 t and Canada 16 t.
Tellurium belongs to the chalcogen (group 16) family of elements on the periodic table, which includes as oxygen, sulfur, selenium and polonium: Tellurium and selenium compounds are similar. Tellurium exhibits the oxidation states −2, +2, +4 and +6, with +4 being most common. 2Te is unstable, whereas salts of its conjugate base [TeH]− are stable. 2 and elemental tellurium upon heating. 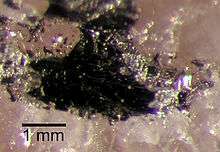 Since then, however, existence in the solid phase is doubted and in dispute, although it is known as a vapor fragment; the black solid may be merely an equimolar mixture of elemental tellurium and tellurium dioxide. Tellurium does not readily form analogues of alcohols and thiols, with the functional group –TeH, that are called tellurols. The –TeH functional group is also attributed using the prefix tellanyl-. Like H2Te, these species are unstable with respect to loss of hydrogen. Telluraethers (R-Te-R) are more stable, as are telluroxides. The largest consumer of tellurium is metallurgy in iron, stainless steel, copper, and lead alloys. The addition to steel and copper produces an alloy more machinable than otherwise. It is alloyed into cast iron for promoting chill for spectroscopy, where the presence of electrically conductive free graphite tends to interfere with spark emission testing results. In lead, tellurium improves strength and durability, and decreases the corrosive action of sulfuric acid. Tellurium is used in cadmium telluride (CdTe) solar panels. National Renewable Energy Laboratory lab tests of tellurium demonstrated some of the greatest efficiencies for solar cell electric power generators. Massive commercial production of CdTe solar panels by First Solar in recent years has significantly increased tellurium demand. When some of the cadmium in CdTe is replaced by zinc, producing (Cd,Zn)Te, the result is a solid-state X-ray detectors, replacing single-use films. Infrared sensitive semiconductor material is formed by alloying tellurium with cadmium and mercury to form mercury cadmium telluride. Organotellurium compounds such as dimethyl telluride, diethyl telluride, diisopropyl telluride, diallyl telluride and methyl allyl telluride are precursors for synthesizing metalorganic vapor phase epitaxy growth of II-VI compound semiconductors. 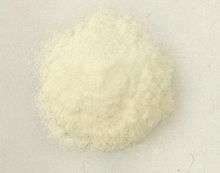 Diisopropyl telluride (DIPTe) is the preferred precursor for low-temperature growth of CdHgTe by MOVPE. The greatest purity metalorganics of both selenium and tellurium are used in these processes. The compounds for semiconductor industry and are prepared by adduct purification. Tellurium, as tellurium suboxide, is used in the media layer of rewritable optical discs, including ReWritable Compact Discs (CD-RW), ReWritable Digital Video Discs (DVD-RW), and ReWritable Blu-ray Discs. Tellurium dioxide is used to create acousto-optic modulators (AOTFs and AOBSs) for confocal microscropy. Tellurium is used in the new phase change memory chips developed by Intel. Bismuth telluride (Bi2Te3) and lead telluride are working elements of thermoelectric devices. Lead telluride is used in far-infrared detectors. Tellurium compounds are used as pigments for ceramics. Selenides and tellurides greatly increase the optical refraction of glass widely used in glass optical fibers for telecommunications. Mixtures of selenium and tellurium are used with barium peroxide as an oxidizer in the delay powder of electric blasting caps. Organic tellurides have been employed as initiators for living radical polymerization and electron-rich mono- and di-tellurides possess antioxidant activity. Rubber can be vulcanized with tellurium instead of sulfur or selenium. The rubber produced in this way shows improved heat resistance. Tellurite agar is used to identify members of the corynebacterium genus, most typically Corynebacterium diphtheriae, the pathogen responsible for diphtheria. Tellurium is a key constituent of high performing mixed oxide catalysts for the heterogeneous catalytic selective oxidation of propane to acrylic acid. The surface elemental composition changes dynamically and reversibly with the reaction conditions. In the presence of steam the surface of the catalyst is enriched in tellurium and vanadium which translates into the enhancement of the acrylic acid production. Tellurium has no known biological function, although fungi can incorporate it in place of sulfur and selenium into amino acids such as telluro-cysteine and telluro-methionine. Organisms have shown a highly variable tolerance to tellurium compounds. Many bacteria, such as Pseudomonas aeruginosa, take up tellurite and reduce it to elemental tellurium, which accumulates and causes a characteristic and often dramatic darkening of cells. In yeast, this reduction is mediated by the sulfate assimilation pathway. Tellurium accumulation seems to account for a major part of the toxicity effects. Many organisms also metabolize tellurium partly to form dimethyl telluride, although dimethyl ditelluride is also formed by some species. Dimethyl telluride has been observed in hot springs at very low concentrations. Tellurium and tellurium compounds are considered to be mildly toxic and need to be handled with care, although acute poisoning is rare. Tellurium poisoning is particularly difficult to treat as many chelation agents used in the treatment of metal poisoning will increase the toxicity of tellurium. Tellurium is not reported to be carcinogenic. Humans exposed to as little as 0.01 mg/m3 or less in air exude a foul garlic-like odor known as "tellurium breath." This is caused by the body converting tellurium from any oxidation state to dimethyl telluride, (CH3)2Te. This is a volatile compound with a pungent garlic-like smell. Even though the metabolic pathways of tellurium are not known, it is generally assumed that they resemble those of the more extensively studied selenium because the final methylated metabolic products of the two elements are similar. People can be exposed to tellurium in the workplace by inhalation, ingestion, skin contact, and eye contact. The Occupational Safety and Health Administration (OSHA) limits (Permissible exposure limit) tellurium exposure in the workplace to 0.1 mg/m3 over an 8-hour workday. The National Institute for Occupational Safety and Health (NIOSH) has set the recommended exposure limit (REL) at 0.1 mg/m3 over an 8-hour workday. In concentrations of 25 mg/m3, tellurium is immediately dangerous to life and health. The 1862 telluric helix of Alexandre-Émile Béguyer de Chancourtois. ↑ Cverna, Fran (2002). "Ch. 2 Thermal Expansion". ASM Ready Reference: Thermal properties of metals (PDF). ASM International. ISBN 978-0-87170-768-0. ↑ Alessandrello, A.; Arnaboldi, C.; Brofferio, C.; Capelli, S.; Cremonesi, O.; Fiorini, E.; Nucciotti, A.; Pavan, M.; Pessina, G.; Pirro, S.; Previtali, E.; Sisti, M.; Vanzini, M.; Zanotti, L.; Giuliani, A.; Pedretti, M.; Bucci, C.; Pobes, C. (2003). "New limits on naturally occurring electron capture of 123Te". Physical Review C. 67: 014323. Bibcode:2003PhRvC..67a4323A. doi:10.1103/PhysRevC.67.014323. 1 2 Ramadan, Shadia E.; Razak, A. A.; Ragab, A. M.; El-Meleigy, M. (1989). "Incorporation of tellurium into amino acids and proteins in a tellurium-tolerant fungi". Biological Trace Element Research. 20 (3): 225–32. doi:10.1007/BF02917437. PMID 2484755. 1 2 Leddicotte, G. W. (1961). "The radiochemistry of tellurium" (PDF). Nuclear science series (3038). Subcommittee on Radiochemistry, National Academy of Sciences-National Research Council: 5. ↑ Berger, Lev Isaakovich (1997). "Tellurium". Semiconductor materials. CRC Press. pp. 89–91. ISBN 978-0-8493-8912-2. 1 2 Audi, G.; Bersillon, O.; Blachot, J.; Wapstra, A.H. (2003). "The NUBASE Evaluation of Nuclear and Decay Properties". Nuclear Physics A. Atomic Mass Data Center. 729: 3–128. Bibcode:2003NuPhA.729....3A. doi:10.1016/j.nuclphysa.2003.11.001. ↑ "WWW Table of Radioactive Isotopes: Tellurium". Nuclear Science Division, Lawrence Berkeley National Laboratory. 2008. Retrieved 2010-01-16. ↑ Alessandrello, A.; Arnaboldi, C.; Brofferio, C.; Capelli, S.; Cremonesi, O.; Fiorini, E.; Nucciotti, A.; Pavan, M.; Pessina, G.; Pirro, S.; Previtali, E.; Sisti, M.; Vanzini, M.; Zanotti, L.; Giuliani, A.; Pedretti, M.; Bucci, C.; Pobes, C. (2003). "New limits on naturally occurring electron capture of 123Te". Physical Review C. 67. arXiv:hep-ex/0211015 . doi:10.1103/PhysRevC.67.014323. ↑ "Noble Gas Research". Laboratory for Space Sciences, Washington University in St. Louis. 2008. Archived from the original on September 28, 2011. Retrieved 2013-01-10. ↑ Emsley, John (2003). "Tellurium". Nature's building blocks: an A-Z guide to the elements. Oxford University Press. pp. 426–429. ISBN 978-0-19-850340-8. ↑ Ayres, Robert U.; Ayres, Leslie (2002). A handbook of industrial ecology. Edward Elgar Publishing. p. 396. ISBN 1-84064-506-7. ↑ Suess, Hans; Urey, Harold (1956). "Abundances of the Elements". Reviews of Modern Physics. 28: 53–74. Bibcode:1956RvMP...28...53S. doi:10.1103/RevModPhys.28.53. ↑ Nekrasov, I. Y. (1996). "Phase Relations in the Selenide Telluride Systems". Geochemistry, mineralogy and genesis of gold deposits. Taylor & Francis. pp. 217–256. ISBN 978-90-5410-723-1. ↑ Fortey, Richard (2004). The Earth: An Intimate History. Harper Perennial. p. 230. ISBN 978-0-00-257011-4. ↑ v. Born, Abh. Privatges. v. Böhmen 5 (1782): 383. ↑ Rupprecht, von, A. (1783). "Über den vermeintlichen siebenbürgischen natürlichen Spiessglaskönig" [On the supposedly native antimony of Transylvania]. Physikalische Arbeiten der einträchtigen Freunde in Wien. 1 (1): 70–74. ↑ Müller, F.J. (1783). "Über den vermeintlichen natürlichen Spiessglaskönig". Physikalische Arbeiten der einträchtigen Freunde in Wien. 1 (1): 57–59. ↑ von Reichenstein, F.J.M. (1783). "Versuche mit dem in der Grube Mariahilf in dem Gebirge Fazebay bey Zalathna vorkommenden vermeinten gediegenen Spiesglaskönig" [Experiments with supposedly native antimony occurring in the Mariahilf mine in the Fazeby mountains near Zalathna]. Physikalische Arbeiten der einträchtigen Freunde in Wien. 1783 (1.Quartal): 63–69. 1 2 Diemann, Ekkehard; Müller, Achim; Barbu, Horia (2002). "Die spannende Entdeckungsgeschichte des Tellurs (1782–1798) Bedeutung und Komplexität von Elemententdeckungen". Chemie in unserer Zeit. 36 (5): 334–337. doi:10.1002/1521-3781(200210)36:5<334::AID-CIUZ334>3.0.CO;2-1. 1 2 Weeks, Mary Elvira (1932). "The discovery of the elements. VI. Tellurium and selenium". Journal of Chemical Education. 9 (3): 474–485. Bibcode:1932JChEd...9..474W. doi:10.1021/ed009p474. ↑ Weeks, Mary Elvira (1935). "The discovery of tellurium". Journal of Chemical Education. 12 (9): 403–408. Bibcode:1935JChEd..12..403W. doi:10.1021/ed012p403. 1 2 George, Micheal W. (2007). "Mineral Yearbook 2007: Selenium and Tellurium" (PDF). United States geological Survey. 1 2 3 4 5 6 7 Wiberg, Egon; Holleman, Arnold Frederick (2001). Nils Wiberg, ed. Inorganic chemistry. translated by Mary Eagleson. Academic Press. p. 588. ISBN 0-12-352651-5. ↑ "An Arizona tellurium rush?". arizonageology.blogspot.com. May 21, 2007. Retrieved 2009-08-08. ↑ "Byproducts Part I: Is There a Tellurium Rush in the Making?". resourceinvestor.com. April 19, 2007. Retrieved 2009-08-08. ↑ Crow, James Mitchell (2011). "13 elements you can't live without". New Scientist. 210 (2817): 39. doi:10.1016/S0262-4079(11)61452-8. ↑ Addicks, Lawrence (2008). "By-Products". Copper Refining. Read books. pp. 111–114. ISBN 978-1-4437-3230-7. ↑ Brown, TJ (2011). World mineral statistics British Geological Survey. Keyworth, Nottingham. p. 95. ISBN 0-85272-677-5. 1 2 Roscoe, Henry Enfield; Schorlemmer, Carl (1878). A treatise on chemistry. 1. Appleton. pp. 367–368. 1 2 3 4 Emeleus, H. J. (1990). A. G. Sykes, ed. Advances in Inorganic Chemistry. 35. Academic Press. ISBN 0-12-023635-4. ↑ Holloway, John H.; Laycock, David (1983). "Preparations and Reactions of Inorganic Main-Group Oxide-Fluorides". In Harry Julius Emeléus; A. G. Sharpe. Advances in inorganic chemistry and radiochemistry. Serial Publication Series. 27. Academic Press. p. 174. ISBN 0-12-023627-3. ↑ Xu, Zhengtao (2007). "Recent developments in binary halogen-chalcogen compounds, polyanions and polycations". In Francesco A. Devillanova. Handbook of chalcogen chemistry: new perspectives in sulfur, selenium and tellurium. Royal Society of Chemistry. pp. 457–466. ISBN 0-85404-366-7. ↑ Schwartz, Mel M. (2002). "Tellurium". Encyclopedia of materials, parts, and finishes (2nd ed.). CRC Press. ISBN 1-56676-661-3. ↑ Divers, Edward; Shimosé, M. (1883). "On a new oxide of tellurium". Journal of the Chemical Society. 43: 319–323. doi:10.1039/CT8834300319. 1 2 Dutton, W. A.; Cooper, W. Charles (1966). "The Oxides and Oxyacids of Tellurium". Chemical Reviews. 66 (6): 657–675. doi:10.1021/cr60244a003. 1 2 Wickleder, Mathias S. (2007). "Chalcogen-Oxygen Chemistry". In Francesco A. Devillanova. Handbook of chalcogen chemistry: new perspectives in sulfur, selenium and tellurium. Royal Society of Chemistry. pp. 348–350. ISBN 0-85404-366-7. ↑ Molnar, Arpad; Olah, George Andrew; Surya Prakash, G. K.; Sommer, Jean (2009). Superacid Chemistry (2nd ed.). Wiley-Interscience. pp. 444–445. ISBN 0-471-59668-X. ↑ Sadekov, I. D.; Zakharov, A. V. (1999). "Stable tellurols and their metal derivatives". Russian Chemical Reviews. 68 (11): 909–923. Bibcode:1999RuCRv..68..909S. doi:10.1070/RC1999v068n11ABEH000544. ↑ Guo, W.X. ; Shu, D.; Chen, H.Y. ; Li, A.J. ; Wang, H.; Xiao, G.M. ; Dou, C.L. ; Peng, S.G.; Wei, W.W.; Zhang, W.; Zhou, H.W. ; Chen, S. (2009). "Study on the structure and property of lead tellurium alloy as the positive grid of lead-acid batteries". Journal of Alloys and Compounds. 475: 102–109. doi:10.1016/j.jallcom.2008.08.011. ↑ Fthenakis, Vasilis M.; Kim, Hyung Chul; Alsema, Erik (2008). "Emissions from Photovoltaic Life Cycles". Environmental Science & Technology. 42 (6): 2168–2174. Bibcode:2008EnST...42.2168F. doi:10.1021/es071763q. ↑ Sinha, Parikhit; Kriegner, Christopher J.; Schew, William A.; Kaczmar, Swiatoslav W.; Traister, Matthew; Wilson, David J. (2008). "Regulatory policy governing cadmium-telluride photovoltaics: A case study contrasting life cycle management with the precautionary principle". Energy Policy. 36: 381–387. doi:10.1016/j.enpol.2007.09.017. ↑ Zweibel, K. (2010). "The Impact of Tellurium Supply on Cadmium Telluride Photovoltaics". Science. 328 (5979): 699–701. Bibcode:2010Sci...328..699Z. doi:10.1126/science.1189690. PMID 20448173. ↑ Saha, Gopal B. (2001). "Cadmium zinc telluride detector". Physics and radiobiology of nuclear medicine. New York: Springer. pp. 87–88. ISBN 978-0-387-95021-1. ↑ Willardson, R.K.; Beer, Albert C, eds. (1981). Mercury cadmium telluride. New York: Academic Press. ISBN 978-0-12-752118-3. ↑ Capper, Peter; Elliott, C. T., eds. (2001). "Metalorganic vapour phase epitaxy". Infrared detectors and emitters : materials and devices. Boston, Mass. : Kluwer Academic. pp. 265–267. ISBN 978-0-7923-7206-6. ↑ Shenai-Khatkhate, Deodatta V.; Webb, Paul; Cole-Hamilton, David J.; Blackmore, Graham W.; Brian Mullin, J. (1988). "Ultra-pure organotellurium precursors for the low-temperature MOVPE growth of II/VI compound semiconductors". Journal of Crystal Growth. 93 (1–4): 744–749. Bibcode:1988JCrGr..93..744S. doi:10.1016/0022-0248(88)90613-6. ↑ Shenai-Khatkhate, Deodatta V.; Parker, M. B.; McQueen, A. E. D.; Mullin, J. B.; Cole-Hamilton, D. J.; Day, P. (1990). "Organometallic Molecules for Semiconductor Fabrication [and Discussion]". Phil. Trans. R. Soc. Lond. A. 330 (1610): 173–182. Bibcode:1990RSPTA.330..173S. doi:10.1098/rsta.1990.0011. ↑ Mullin, J.B.; Cole-Hamilton, D.J. ; Shenai-Khatkhate, D.V. ; Webb P. (May 26, 1992) U.S. Patent 5,117,021 "Method for purification of tellurium and selenium alkyls"
↑ Farivar, Cyrus (2006-10-19). "Panasonic says that its 100GB Blu-ray discs will last a century". Retrieved 2008-11-13. ↑ Nishiuchi, Kenichi; Kitaura, Hideki; Yamada, Noboru; Akahira, Nobuo (1998). "Dual-Layer Optical Disk with Te–O–Pd Phase-Change Film". Japanese Journal of Applied Physics. 37: 2163–2167. Bibcode:1998JaJAP..37.2163N. doi:10.1143/JJAP.37.2163. ↑ Hudgens, S.; Johnson, B. (2004). "Overview of Phase-Change Chalcogenide Nonvolatile Memory Technology". Material Research Society Bulletin. 29 (11): 1–4. doi:10.1557/mrs2004.236. PMC 4182445 . PMID 25278820. ↑ Geppert, Linda (2003). "The New Indelible Memories". Spectrum, IEEE. 40 (3): 48–54. doi:10.1109/MSPEC.2003.1184436. 1 2 Lide, D. R., ed. (2005). CRC Handbook of Chemistry and Physics (86th ed.). Boca Raton (FL): CRC Press. ISBN 0-8493-0486-5. ↑ Nishii, J.; Morimoto, S.; Inagawa, I.; Iizuka, R.; Yamashita, T.; Yamagishi, T. (1992). "Recent advances and trends in chalcogenide glass fiber technology: a review". Journal of Non-Crystalline Solids. 140: 199–208. Bibcode:1992JNCS..140..199N. doi:10.1016/S0022-3093(05)80767-7. ↑ El-Mallawany, Raouf A. H. (2002). Tellurite glasses handbook: physical properties and data. CRC Press. pp. 1–11. ISBN 978-0-8493-0368-5. ↑ Johnson, L. B. (1960). "Correspondence. Representing Delay Powder Data.". Industrial & Engineering Chemistry. 52 (10): 868. doi:10.1021/ie50610a035. ↑ Morton, Maurice (1987). "Sulfur and Related Elements". Rubber Technology. Springer. p. 42. ISBN 978-0-412-53950-3. 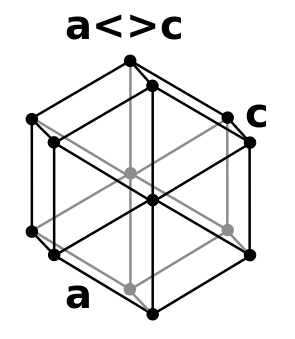 ↑ Kwantes, W. (1984). "Diphtheria in Europe". The Journal of Hygiene. 93 (3): 433–437. doi:10.1017/S0022172400065025. JSTOR 3862778. PMC 2129475 . PMID 6512248. ↑ Amakawa, Kazuhiko; Kolen'Ko, Yury V.; Villa, Alberto; Schuster, Manfred E/; Csepei, Lénárd-István; Weinberg, Gisela; Wrabetz, Sabine; Naumann d'Alnoncourt, Raoul; Girgsdies, Frank; Prati, Laura; Schlögl, Robert; Trunschke, Annette (2013). "Multifunctionality of Crystalline MoV(TeNb) M1 Oxide Catalysts in Selective Oxidation of Propane and Benzyl Alcohol". ACS Catalysis. 3 (6): 1103–1113. doi:10.1021/cs400010q. ↑ Csepei, L.-I. (2011). "Kinetic studies of propane oxidation on Mo and V based mixed oxide catalysts". PhD Thesis, Technische Universität, Berlin. ↑ Hävecker, Michael; Wrabetz, Sabine; Kröhnert, Jutta; Csepei, Lenard-Istvan; Naumann d'Alnoncourt, Raoul; Kolen'Ko, Yury V.; Girgsdies, Frank; Schlögl, Robert; Trunschke, Annette (2012). "Surface chemistry of phase-pure M1 MoVTeNb oxide during operation in selective oxidation of propane to acrylic acid". Journal of Catalysis. 285: 48–60. doi:10.1016/j.jcat.2011.09.012. ↑ Naumann d'Alnoncourt, Raoul; Csepei, Lénárd-István; Hävecker, Michael; Girgsdies, Frank; Schuster, Manfred E.; Schlögl, Robert; Trunschke, Annette (2014). "The reaction network in propane oxidation over phase-pure MoVTeNb M1 oxide catalysts". Journal of Catalysis. 311: 369–385. doi:10.1016/j.jcat.2013.12.008. ↑ Atta-ur- Rahman (2008). Studies in Natural Products Chemistry. Elsevier. pp. 905–. ISBN 978-0-444-53181-0. ↑ Ottosson, LG; Logg, K; Ibstedt, S; Sunnerhagen, P; Käll, M; Blomberg, A; Warringer, J (2010). "Sulfate assimilation mediates tellurite reduction and toxicity in Saccharomyces cerevisiae". Eukaryotic Cell. 9 (10): 1635–47. doi:10.1128/EC.00078-10. PMC 2950436 . PMID 20675578. ↑ Chasteen, Thomas G.; Bentley, Ronald (2003). "Biomethylation of Selenium and Tellurium: Microorganisms and Plants". Chemical Reviews. 103 (1): 1–26. doi:10.1021/cr010210+. PMID 12517179. ↑ Taylor, Andrew (1996). "Biochemistry of tellurium". Biological Trace Element Research. 55 (3): 231–9. doi:10.1007/BF02785282. PMID 9096851. 1 2 Harrison, W.; Bradberry, S.; Vale, J. (1998-01-28). "Tellurium". International Programme on Chemical Safety. Retrieved 2007-01-12. ↑ Wright, PL; B (1966). "Comparative metabolism of selenium and tellurium in sheep and swine". AJP: Legacy. 211 (1): 6–10. PMID 5911055. ↑ Müller, R.; Zschiesche, W.; Steffen, H. M.; Schaller, K. H. (1989). "Tellurium-intoxication". Klinische Wochenschrift. 67 (22): 1152–5. doi:10.1007/BF01726117. PMID 2586020. ↑ Taylor, Andrew (1996). "Biochemistry of tellurium". Biological Trace Element Research. 55 (3): 231–239. doi:10.1007/BF02785282. PMID 9096851. ↑ "CDC – NIOSH Pocket Guide to Chemical Hazards – Tellurium". www.cdc.gov. Retrieved 2015-11-24. Wikimedia Commons has media related to Tellurium. Look up tellurium in Wiktionary, the free dictionary.